Parrott scored three goals as Ireland made it to the quarter-finals of the U17 European Championships. THE POPULAR MOTIVATIONAL slogan made famous by NBA star Kevin Durrant goes something like: “Hard work beats talent when talent fails to work hard.” So what happens when someone is blessed with God-given talent, and they also have the mentality and motivation to put in the hard yards too? Dubliner Troy Parrott is putting that question to the test. The teenager, born and raised in Buckingham Street in Dublin’s inner city, has risen to prominence in an extraordinary manner over the course of the past year. Last Sunday night in Donnybrook the 17-year-old collected his second successive FAI International Award, following up last year’s U15 Player of the Year with the U16 equivalent at RTÉ studios in front of an audience which included Mick McCarthy, Robbie Keane and Seamus Coleman watching on. Great things are expected of Parrott in the future, a prolific striker who has trained with Mauricio Pochettino’s senior Spurs side on numerous occasions this season and an underage international who received his first U21 call-up by Stephen Kenny just two weeks ago. With Ireland managing to score just four senior international goals in 2018, some have even jibed that he ought to be called up into Mick McCarthy’s squad to show the rest of his countrymen how to stick the ball in the back of the net — many only half-joking in their suggestion, such is the buzz of excitement around him at the moment. Those who know the young Dubliner best say his desire to improve has been instrumental to his success. Sure, they say, he has the talent. Plenty of young players have talent. But those like his former Ireland U17 boss Colin O’Brien insist that Parrott also has the awareness and maturity to put in the hard work, too. To always strive and push limits, get better and not slip into complacency. The forward made headlines last summer after scoring three goals as Ireland made it all the way to the quarter-finals of the Uefa U17 European Championships, where the Boys in Green controversially exited on penalties to eventual winners Holland. 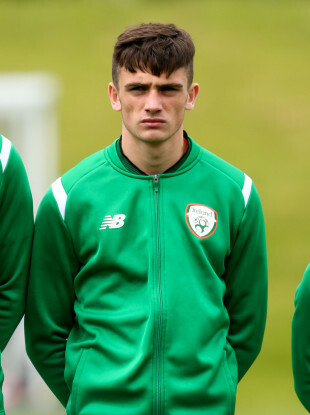 I am absolutely delighted for him,” O’Brien says reflecting on Parrott’s development since last summer’s Euros, as a new U17 side prepare for this year’s competition — which is held on home soil for the very first time. Parrott just recently turned 17 and is still eligible to represent his country at this year’s U17 European Championships — the competition will be hosted in Dublin, Longford, Wicklow and Waterford. But following his call-up to Stephen Kenny’s U21 side a fortnight ago, the player has gone on to another level again in the blink of an eye. “Progression is what it’s all about,” says O’Brien. “I’ve been asked a lot about his availability for us [for this year’s U17 Euros] and there is almost a sense of disappointment in people’s voice where we just have to accept that the boy has progressed to a higher age group already. As with every promising underage player, there is a crucial desire to protect them from the weight of expectation at such a young age. Parrott’s ability with the ball at his feet alone is impressive, but the accolades he has chalked up before his 17th birthday has been even more staggering. Seeing a Dublin teenager training alongside Harry Kane, Dele Alli and Jan Vertonghen and being name-checked by a manager like Pochettino during Premier League press conferences is not an everyday thing. All of this, as a result, has created an intrigue with what makes a player like Parrott so unique and special. He’s got a good mix of talent, determination and work rate,” says O’Brien, who played an important role in his development with the Ireland U17s over the last two years. “Personally I’ve always just liked his mentality. He’s one of these attacking players that does his defending duties as well. You nearly have to get him to curb his defending a little bit, but that’s fine. You’d rather that than the other way around. Speaking with The42, O’Brien constantly picks out Parrott’s internal motivation as crucial to his current success. It’s not solely about what a coach can teach him, but about how Parrott takes the weight of expectation on his own shoulders and drives himself on through an ongoing, internalised self-motivation. “There’s just a real love of the game there with Troy,” O’Brien explains. “There’s a huge desire… even with training, he’s on the pitch first. He wants to get going straight away, doesn’t want training sessions to end at all. Last Sunday the Irish public recognised Parrott’s success over the last year via the televised FAI Awards on RTÉ 2. Soft-spoken and exceedingly modest, Parrott said how grateful he was for the opportunities he has been given after receiving his Player of the Year award. Later this afternoon at Tallaght Stadium Stephen Kenny will take charge of his first competitive game as Ireland U21 manager against Luxembourg. Parrott was called into the ex-Dundalk boss’s initial squad, but will not feature after being ruled out with a toe injury. Parrott recently underwent surgery to correct the setback and is expected to play an important role as Ireland try and qualify for their first ever Uefa U21 European Championships before Kenny succeeds Mick McCarthy as Ireland’s senior manager in 16 months’ time. It’s a real honour to get called up to 21s,” Parrott said last Sunday speaking about being included in Kenny’s initial squad. “And to get called up at any age is such an honour. There will be more than a few disappointed onlookers at Tallaght Stadium with the striker’s absence, but many also know there will be plenty more opportunities to see Parrott in an Ireland jersey in the near future all going according to plan. “Troy is just a case of talent that works hard,” says his former manager O’Brien when asked to try and explain the forward’s rapid development over the past year, adding that it is also vital to recognise that this is still a kid who needs the time, space and freedom to simply play his football. “Hard work beats talent when talent fails to work hard,” said Kevin Durrant. Still just 17 and with the world at his feet with Tottenham and the national team, Parrott has shown that both combined together is the dream partnership to achieving success. No room for complacency or standing still, but just an ongoing, internalised desire to keep getting better. Talent, which works hard. Email “‘Troy has that bit of streetwise-ness about him’: Parrott's mentality key to young Tottenham star's rise”. Feedback on “‘Troy has that bit of streetwise-ness about him’: Parrott's mentality key to young Tottenham star's rise”.